I love spring training. For that matter, despite my seasonal allergies, I love spring. The long, cold months of no baseball are over, a new season is just around the corner, and everything is still possible. I look forward to our annual weekend jaunt to Scottsdale (t-minus six days) like almost nothing else each year. So a week of games is completed, and the Giants’ Cactus League record is a less-than-inspiring 2-5-1, and even the tie happened because the Giants’ relievers gave up seven (7) runs in the bottom of the ninth, coughing up what was once a 10-1 lead. Still, there are good reasons to dismiss the W-L record and even some of the bad stats and other reasons to be optimistic and intrigued. The Giants are hitting a ton and scoring a lot of runs. They’re also hitting a lot of those things–what do you call them?–you know, when the batter gets to go around all the bases?–I’m sure you know what I mean. Don’t believe me? Check it out. 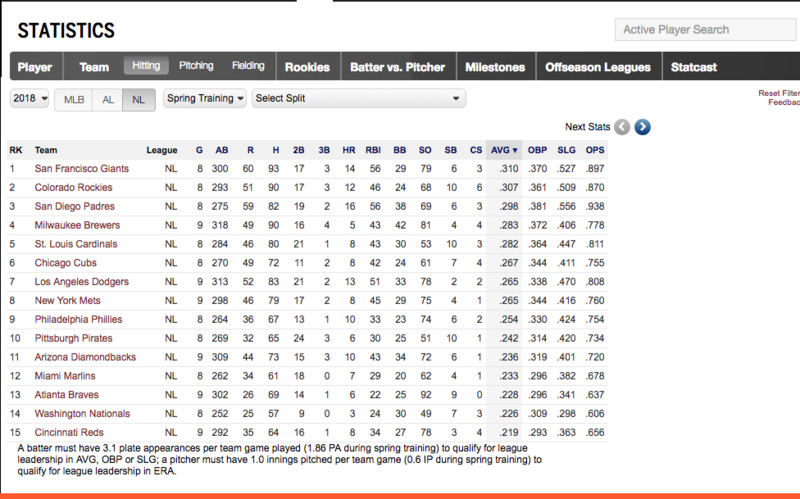 Here are the NL hitting stats for spring training. The Giants lead most of the offensive categories. The core bullpen guys who have pitched–Dyson, Gearrin, Strickland, Osich, and Okert–have ERAs of 0.00. Derek Law has given up one run. The inflated ERAs and the blown leads (leading to the bad W-L record)? Those are the work of schmoes like Rule 5 Guy, Pudge Rodriguez’s kid, Roberto Gomez (I still don’t get why the September call-up last year), and so on. The back-of-the-rotation starters are also looking great so far, with both Blach and Stratton sporting unblemished ERAs and Blach second on the team in strikeouts with 7. The team leader in strikeouts is some Bumgarner guy (9), who pitched three perfect innings yesterday–probably because that Posey guy wasn’t catching him. Well…the W-L record. And the team ERA of 5.38 (11th in the NL)–but see “schmoes,” above. Oh, and the 18 errors, by far the worst in the NL so far. But if you look at who’s actually made the errors, the only one of the 18 committed by a prospective starter is one by Joe Panik. Eleven of the 18 were made by Chase d’Arnaud (3–more on him below) and two each by Jensen, Hanson, Calixte, and Jonah Arenado. None of those guys are going to be in Dodger Stadium on March 29. The hospital ward: As one Twitter user put it, the Giants’ regulars have hardly played…and yet they’re still injured. Pence was out with an injury and then the flu. Posey has an ankle tweak. Crawford jammed his finger. I’m not sure why Jackson and Longoria have barely played. Oh, and even Hector Sanchez is out with a hamstring strain, which should be no surprise to those of us who watched him lumber around the bases last weekend. So all those gaudy offensive stats? A lot of them were created by…all together now…schmoes. Rule 5 Guy: His name is actually Julian Fernandez, and when the Giants picked him in December, I looked him up and was immediately bewildered that they’d used their #2 pick on a guy who hadn’t pitched above A ball (same league as Augusta) and who is clearly a Wild Thing. Well, so far his ERA is 216.00 after two appearances–it actually went down in his second outing when he finally recorded an out–and it looks like, not surprisingly, the Giants wasted that pick and $25,000. Now, maybe there wasn’t anyone better whom they should have picked, but…I hope somebody different is in charge of the June draft. Among the schmoes, there are a few intriguing standouts. Kyle Jensen: Did you know that was him in the picture at the top? Don’t feel bad–I wouldn’t have, either. So Kyle Jensen is a Walnut Creek-native who played in Japan last year. He broke in with the Diamondbacks in 2016, and as Baggarly helpfully noted a couple weeks ago, his first major league hit was a home run off Bumgarner. Anyway, he’s already hit four home runs in one week of Cactus League play. Chris Marrero, whom we all remember, I’m sure, unexpectedly made the team last year by hitting eight home runs. Jensen is ticketed as the first baseman for the River Cats, but if he hits 10 more home runs this month, who knows? I read that they’re going to give him a look in the outfield, too. Watch out, Pablo (or Parker/Mac, etc.). Chase d’Arnaud: Yeah, OK, so he’s made errors in 30% of his chances in the field. He’s also hitting .400 with 3 stolen bases and seems to be a lively, delightful fellow as well. Miguel Gomez: Gomez seems to have a really nice bat and he’s a switch-hitter. 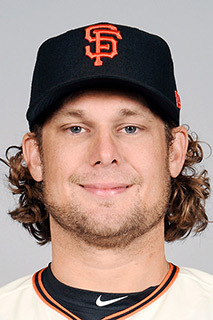 Is there a spot for him to back up lefty-hitting Joe Panik at 2B? We shall see. Mac Williamson: One of the most intriguing stories of camp is about how Mac took lessons with the same hitting guru in LA who turned Justin Turner from a pale, lumpy DFA to a very rich MVP candidate. So far, so good, as he’s hitting .333 and has three extra-base hits (two homers) out of his five total hits so far. Andrew Suarez: Suarez hasn’t quite kept pace with Blach and Stratton (meaning he actually has an ERA), but apparently he’s impressed everyone with his poise, his competitiveness, and his stuff, especially his slider. Kerry Crowley, the Giants’ beat writer for the Merc (St. Ignatius, ’12), interviewed Aramis Garcia for an article a couple days ago, and Garcia highly praised Suarez’s slider, saying it was a pitch he wouldn’t want to have to hit against. Join us on March 31 when the #Dodgers will receive their 2017 National League Championship rings prior to the game against the Giants. NL Championship rings? Is that a thing? Everyone is wondering whether they’ll be wearing silver-lettered jerseys instead of gold ones, since they came in second. See you later today or tomorrow morning.